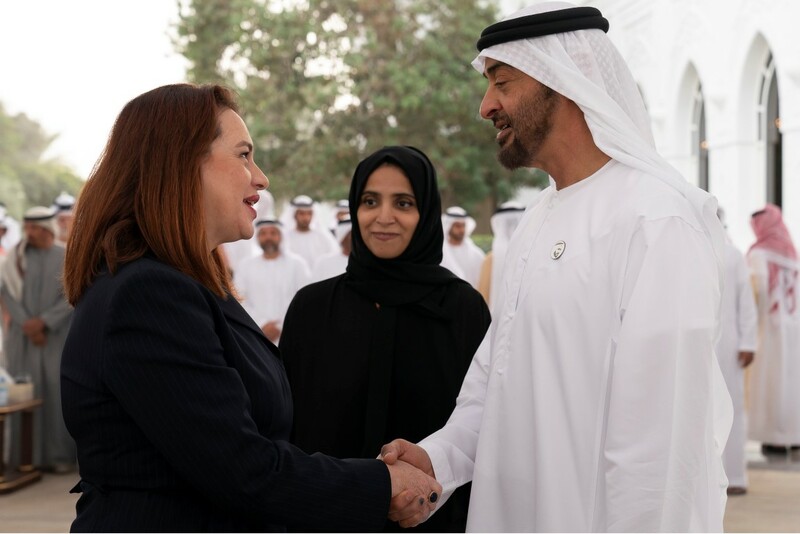 ABU DHABI, 11th February, 2019 (WAM) -- His Highness Sheikh Mohamed bin Zayed Al Nahyan, Crown Prince of Abu Dhabi and Deputy Supreme Commander of the UAE Armed Forces, received today at Al Bahr Palace, Maria Fernanda Espinosa, President of the United Nations General Assembly, UNGA, at Al Bahr Palace, today. Espinosa is currently visiting the UAE to take part in the 7th World Government Summit 2019 which is being held in Dubai. His Highness Sheikh Mohamed bin Zayed discussed with Espinosa, ways to enhance cooperation between the UAE and the UN in the humanitarian and development fields, and the importance of supporting climate changes issues for the benefit of people. They also tackled ways to develop cooperation between the UAE and the UN to back security, peace and stability topics in various regions globally. They also reviewed a number of regional and international issues of mutual interest. His Highness Sheikh Mohamed emphasised the UAE's desire to build effective and strong partnerships with international organisations related to overall and sustainable development for the advantage of the peoples of the world. Espinosa hailed the UAE's efforts and role in the development and humanitarian fields. She also praised the summit hosted by the UAE which contributes to strengthening the pillars of sustainability and wellbeing as well as safeguarding the future. Among those who attended the meeting were H.H. Sheikh Abdullah bin Rashid Al Mu'alla, Deputy Ruler of Umm Al Qaiwain; H.H. Sheikh Hamdan bin Zayed Al Nahyan, Ruler's Representative in Al Dhafra Region; H.H. Sheikh Hazza bin Zayed Al Nahyan, Deputy Chairman of Abu Dhabi Executive Council; H.H. Sheikh Issa bin Zayed Al Nahyan; H.H. Sheikh Nahyan bin Zayed Al Nahyan, Chairman of the Board of Trustees of Zayed bin Sultan Al Nahyan Charitable and Humanitarian Foundation; H.H. Sheikh Hamed bin Zayed Al Nahyan, Chief of the Abu Dhabi Crown Prince's Court, and H.H. Sheikh Khalid bin Zayed Al Nahyan, Chairman of the Board of Zayed Higher Organisation for Humanitarian Care & Special Needs, ZHO.